Rolled Blueprint Cubby Shelves are a very cost and space efficient drafting & architectural large document storage solution. Specifically designed shelving units with cubby slots will maximize the amount of rolled blueprints you can store. The adjustable dividers allow you to modify the size of the cubby slots depending on your requirements. 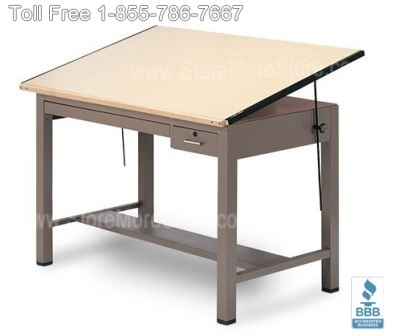 Art Drawing Tables are durable and made to last. With height and tilt adjustments, you can make sure this drafting & architectural large document storage solution is ergonomically comfortable for you. 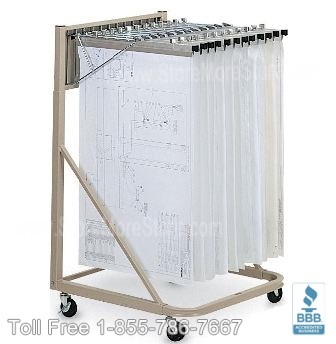 Hanging Plan Drawing Racks offer the benefits of quick retrieval and eliminating curled edges. These hanging racks can be placed in shelving units, wall mounted, on a stand, and even on mobile carts. The ability for the racks to be transported wherever you are, makes them an extremely convenient and easy to use drafting & architectural large document storage solution. 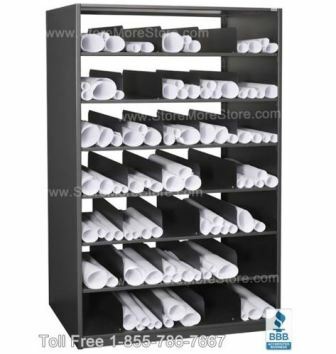 Shop online now at StoreMoreStore for all of our drafting & architectural large document storage solutions including Rolled Blueprint Cubby Shelves, Art Drawing Tables, and Hanging Plan Drawing Racks. If you need any assistance, please feel free to give us a call at out toll free number 1-855-786-7667.